From 3-7 October the first archaeological excavations at the Glory Hole site were carried out, followed by Open Days on 8-9 October. The British team worked closely with GEIOS (Groupe d’Intervention et d’Etude des Ouvrages Souterrains), French archaeologists and the Service Déminage. Brian Todd from Bactec International, specialists in explosive ordnance, EOD, bomb disposal and landmine clearance, was on hand at the start of the week to provide an ordnance awareness briefing. Local people offered invaluable assistance. British and German trenches both within the site and beyond the boundaries towards the Lochnagar crater were marked out with flags, yellow indicating French and British positions, with red for the German front line. This exercise was invaluable in understanding the location of the site within the wider landscape of battle. Site aerials with trench lines overlaid can be viewed here: Aerial Photographs. Linesman (a system of wartime trench maps tied to modern maps by means of a GPS interface) was employed to trace the original lines. The results were cross-referenced to coordinates from a 1915 aerial photograph overlaid upon images from Google Earth. An error of approximately five metres was discovered on the wartime British maps available on the Linesman system. This could be checked against existing known trenches still visible in the landscape. Trench board marking location of Tranchée Quémart,named after Reserve Second Lieutenant Frédéric Quémar, 19th Infantry Regiment, killed 3 February 1915. 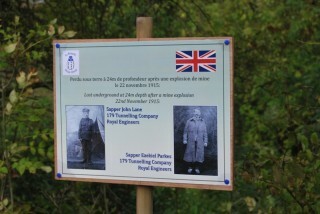 Front lines and trench names were marked with sign boards. Both the French and British trench names were given and in the case of the French names, the soldiers after whom the trenches were named. Some 21 French, British and German shaft heads were also marked. In addition, panels showing the locations of 38 French and British miners whose remains still lie in collapsed tunnels were placed on the surface directly above (or as close as possible) to their underground positions. If photographs of the men were available, these too were included on the panels. In the case of the French, casualty report forms were reproduced. 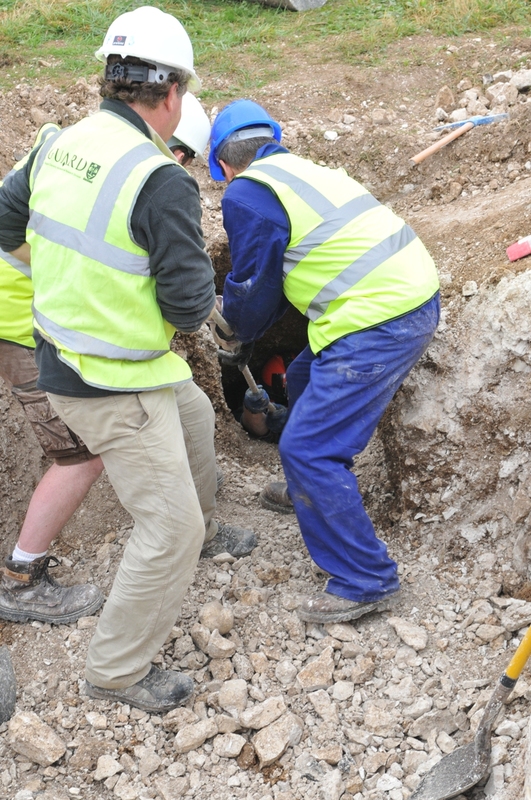 As soon as archival studies are completed the same exercise will be carried out for the many German tunnellers who still lie beneath the site. 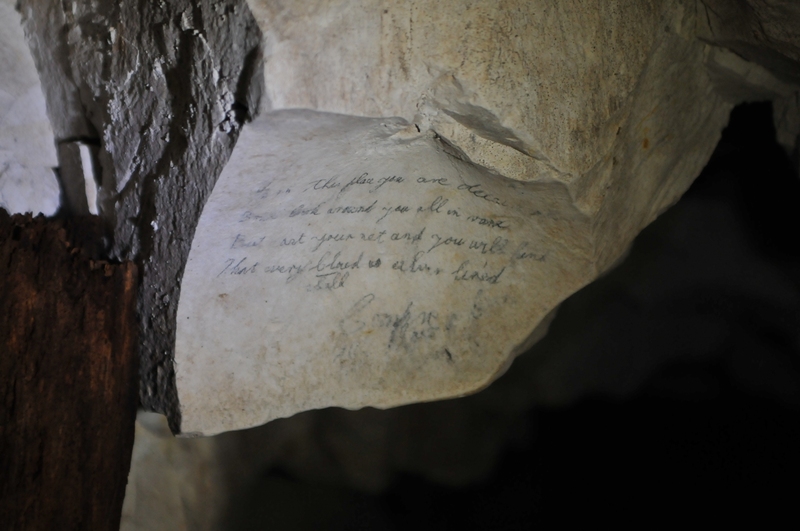 Signs mark the spot where eight French miners still lie underground, killed by a mine explosion on 7 February 1915. 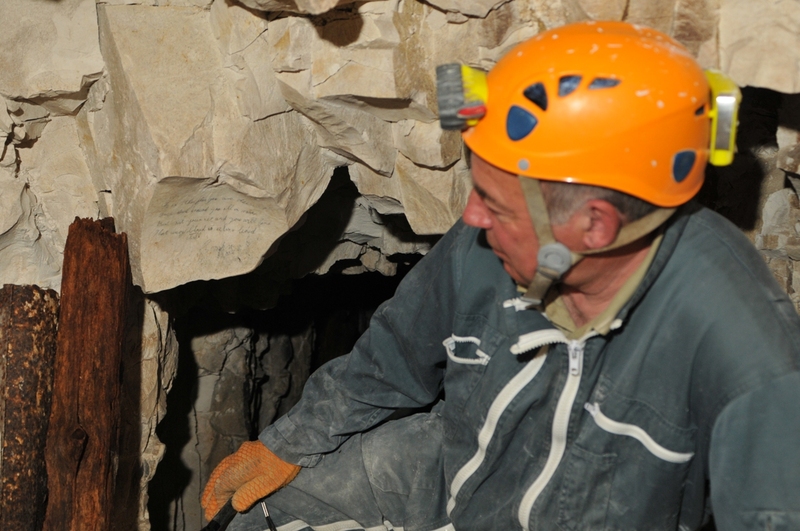 Archaeology was carried out by qualified French archaeologists under the direction of Anthony Byledbal and with the authorisation of the Directions Régionales des Affaires Culturelles (DRAC). 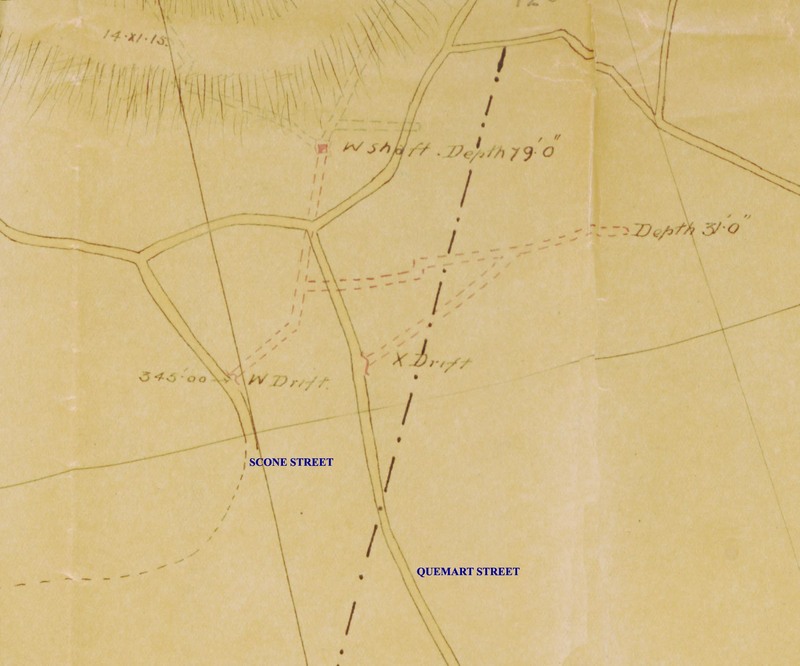 Extract from 179 Tunnelling Company RE Mining Map showing locations of the 1915 X and Y Inclines and the 1916 W Adit. Copyright National Archives, Ref: WO153/904 & reproduced with their permission. The archaeological objective for the week was to explore two mine entrances (X Incline and W Adit) and sections of their associated trenches. This was to establish their design and construction, an aspect that was either not recorded in British war diaries, or for which the relevant documents are missing or lost. It was hoped that a sondageto locate remnants of the Granathof farm buildings may have formed part of the study, but because it had proved impossible to organise the relevant geophysics (resistivity) prior to the excavations, this facet has been put on hold. 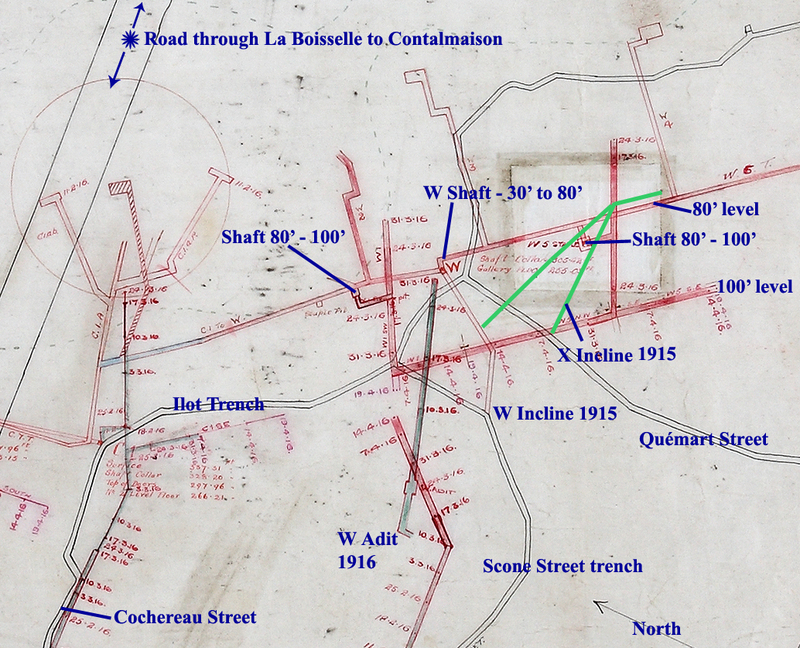 Instead a section was cut through Quémart Street trench, which in 1916 formed part of the British front line, to ascertain its depth and design. X Incline was one of five similar features which British records state were commenced in September 1915 immediately behind the front line, which at that time skirted the crater lips. 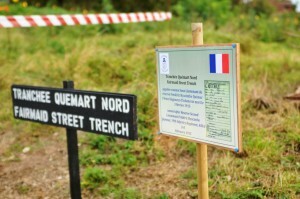 This particular entrance originated in Quémart Street, a communication trench originally constructed by French troops, which later became front line. The tunnellers’ objective was to sink an entrance gallery to a depth whereby tunnels might be driven beneath the level of German workings which were approaching dangerously close to the British front line. Our original entry into X Incline. Until archaeology commenced in October 2011 this collapse, from 2010, was the only way into the tunnel system. 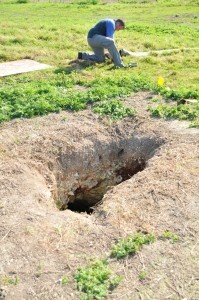 Staff Sergeant Steve Boylan RE can be seen preparing air pipe for use underground. 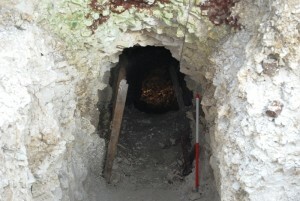 It proved impossible to locate the junction of the incline and Quémart Street as a result of the archaeologists uncovering a mass of materiel in the tunnel entrance consisting of rum jars, jam and condensed milk tins, Maconochie and bully beef tins (British), bottles (French and British), pickle jars, bullets, and some more personal items such as a silver-plated hip flask. 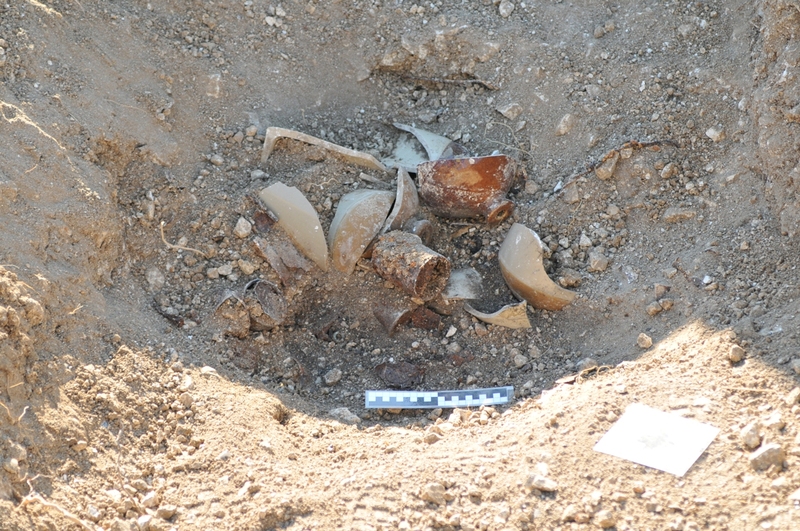 In addition large quantities of well-preserved and hazardous barbed wire fragments, apparently French, and an original iron picket were also found here. 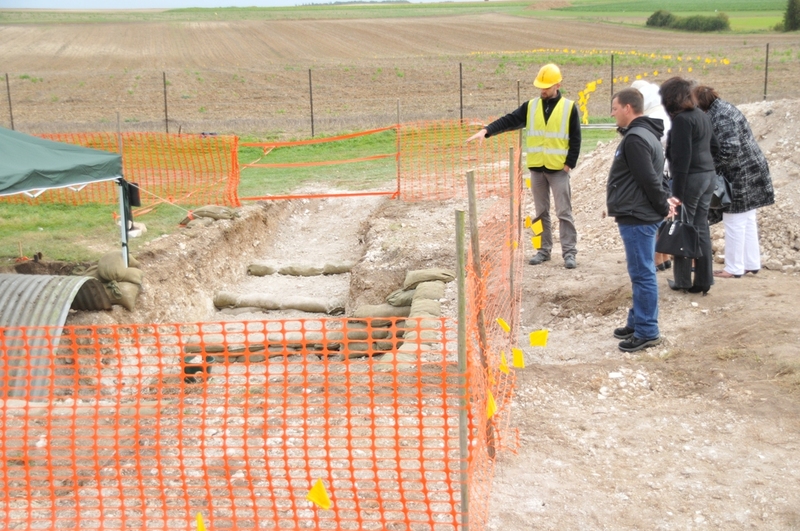 The careful extraction of the artefacts meant that progress was slowed; the remaining few metres of tunnel/covered trench connecting to Quémart will be completed next spring. 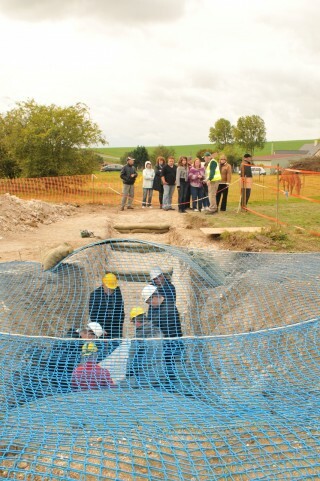 The area above the shallow ‘throat’ of the gallery close to where it joins the trench had apparently collapsed. It may in fact not have had solid earth head cover but some other form of splinter-proof protection such as elephant shelter sections or heavy timbers. Once this protection decayed or was removed, the surrounding geology would have readily caved in and filled the gallery. Trench materiel from the tunnel entrance included rum jars, jam and condensed milk tins and Maconochie and bully beef tins. The large artefact collection found here may have been rubbish produced and discarded by the occupants of Quémart Street, or detritus collected and dumped by land clearers in the post-war period. 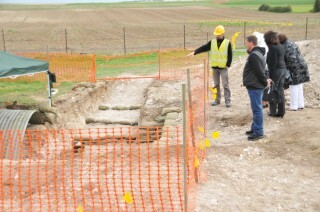 The area was eventually cleared by the archaeologists, revealing much of the collapsed gallery entrance beneath. Vertical timber supports (legs) were still in evidence but in a severely decayed state. The original floor level of the shallow gradient leading to the steeper 40-degree main slope of X Incline had been created by a series of sandbag steps. X Incline after opening and clearing. Vertical timber supports are still in evidence, but in a severely decayed state. These, studied alongside the narrow and low gallery dimensions, showed that spoil was being carried from the workings by hand rather than with trolley run on rails. At the point where the gallery begins its steeper descent the dimensions of the timber support frame (known as a sett) were 0.84m wide at the base (the sole), 1.12m high (legs), and 0.45m wide at the roof (cap). British tunnellers did not work on X Incline for long. Although the workings were abandoned in favour of W Adit, the galleries were kept open as alternative escape routes. Some of the workforce were employed in the sinking of 50-foot vertical shafts from chambers at the 30-foot level. Because French records also note the existence of a feature annotated as ‘X’, research is underway into the precise origin of this incline. W Adit was driven in March 1916 to create improved access to W Shaft. 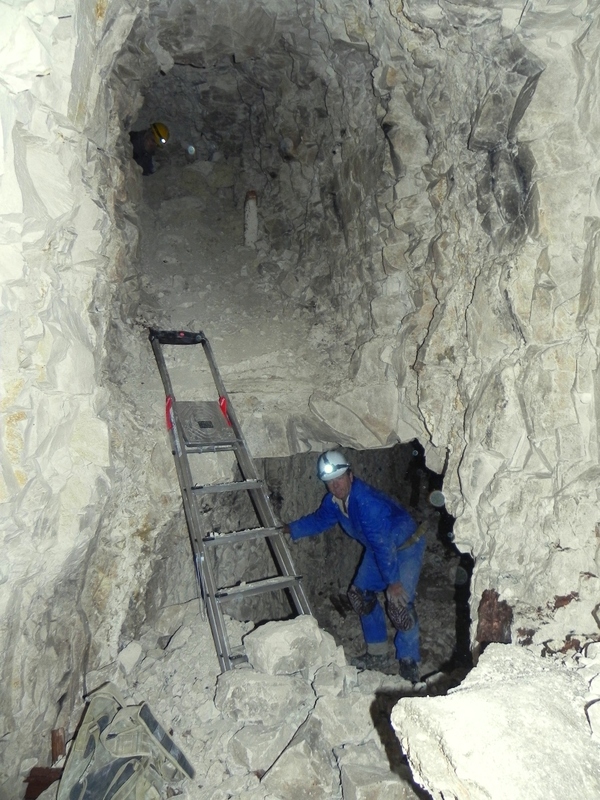 It greatly facilitated removal of spoil from the shaft which itself enhanced access to the 80 foot mine system. By the sinking of further shafts this level was extended to a depth of 100 feet (30 metres), so vast quantities of spoil would have had to have been removed via the W Shaft route. The water table was reached at just over 100 feet. 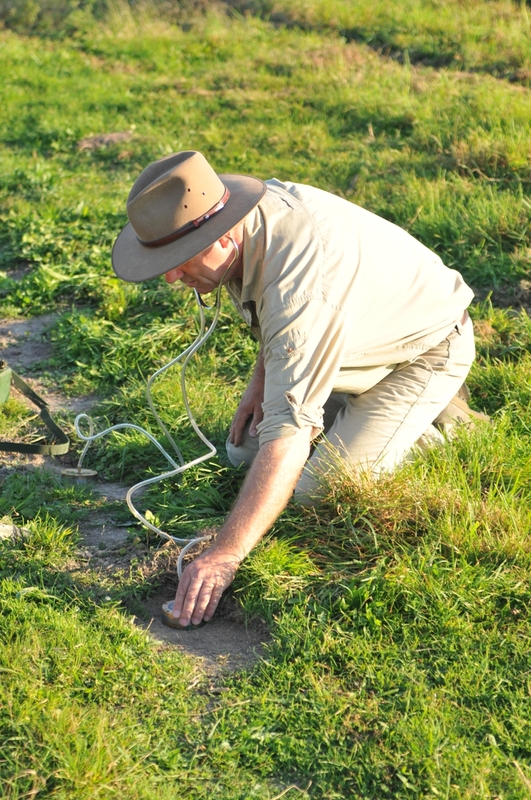 Peter Barton using a geophone to plot the location of W Adit. Team members two metres beneath him in W Adit tapped on each gallery wall, the sound being located and plotted on the surface. In order to reopen W Adit its location first had to be identified on the surface. This was done by using a Geophone, the original device developed in 1915 for underground warfare. Team members inside the gallery, i.e. underground, were in contact with their surface colleagues by field telephone. They were requested to tap on each gallery wall respectively, and the sound was located by Geophone and plotted on the surface by stones. Despite a complete lack of experience by the operator, the method proved highly effective, producing an error of only 40 centimetres. The gallery was quickly found. 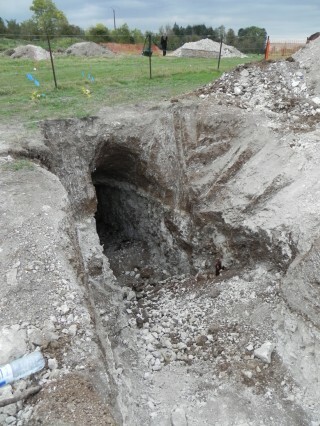 Its upper section was found to have collapsed along a length of approximately seven metres from where it originated in Scone Street, a British communication trench. This failure too may have been as a result of the removal of timber or steel splinter-proof protection. The remnants of heavy upright timbers were found, indicating that some form of cover is likely to have been present. It is certain that large amounts of earth was piled on top of this most vulnerable part of the Adit to form deflection and burster courses against the effects of shell and mortar fire. Villagers inspect the newly opened W Adit. The gallery of W Adit was considerably more roomy than X Incline, being 1.80m high and 1.45m wide. The slope was much more gradual than X Incline. In the centre of the gallery there were clear vestiges of the tramway that had been fitted to facilitate the extraction of chalk spoil produced by the driving of the 80 and 100 feet systems and their associated features. The tramway was of a typical sleeper and rail pattern and appeared to have been fitted with wooden rails. 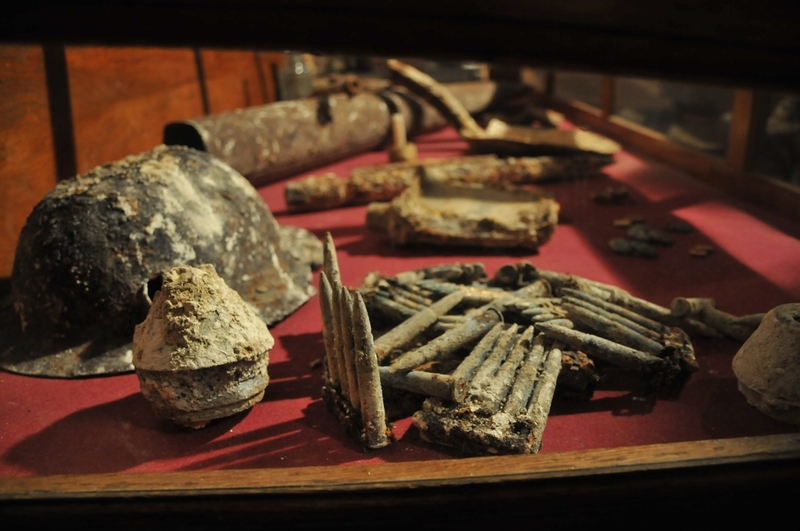 As well as spoil removal it would have been used to carry timber down to the shaft head – and of course explosives for the many charges blown underground during the period of active mine warfare. 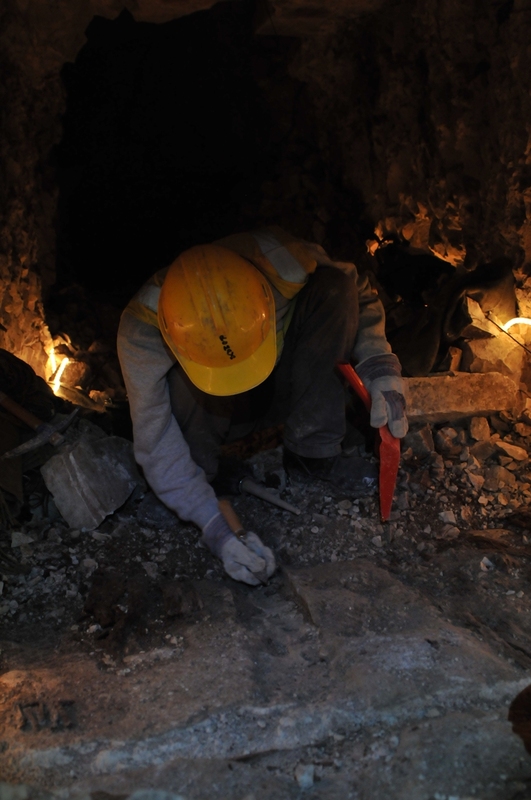 The archaeology of the original floor of W Adit will be completed during the winter of 2011-2012. The opening of the W Adit was required not only to provide safe access to W Shaft chamber but also to produce circulation of fresh air through the galleries connecting the two entrances. Opening both entrances created a natural flow, with X Incline forming the downcast feed and W Adit the upcast vent. 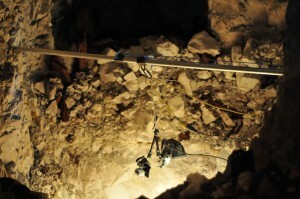 A Go-Pro HD camera ready for its descent down the 50 foot W Shaft. 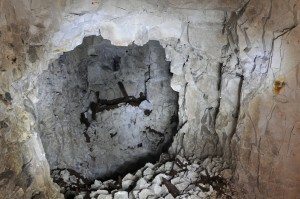 Footage showed the shaft to be in an excellent state of preservation along its entire visible depth. With access and ventilation thus improved, a Go-Pro HD camera was lowered down the 50-foot shaft in order to ascertain the structural integrity of the square cut unsupported chalk walls (approximately 1.5m square) and conditions at the foot. The images revealed that the shaft was in an excellent state of preservation along its entire visible depth. 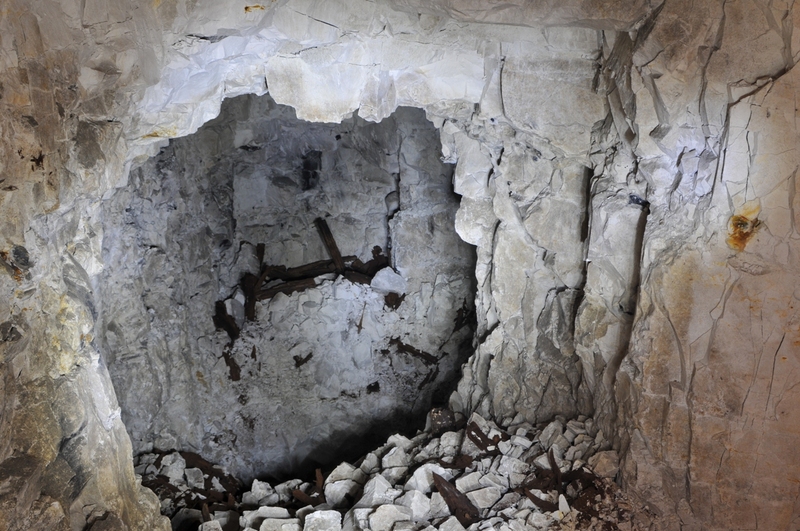 At the base, debris fallen from the area around the shaft collar and the roof of the chamber appears to have reached a depth of 3-4 feet, blocking access the two galleries that emanate in roughly east and west directions at the 80-foot level at the foot of the shaft. W Shaft chamber. The entire area needs clearance, making safe and archaeology before a descent to the lower level can be attempted. The next phase of work underground will be preparations to descend the shaft. 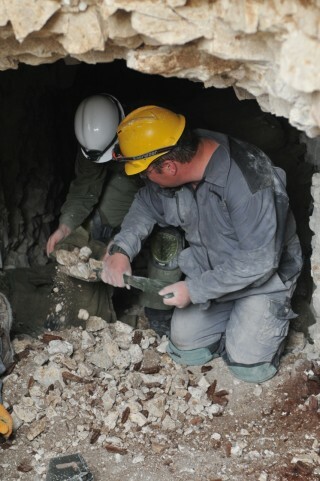 This will begin with the complex task of roof support in conjunction with debris clearance and archaeology along the entire length of the Adit and within the shaft chamber itself. Only after these areas have been made safe will a descent of the shaft be attempted. In the meantime research in British, French and German archives will continue in parallel with the archaeology of the incline and Adit. Excavations to locate the remnants of the Granathof, the farm originally located on the site, are not yet underway as we await the resistivity survey. 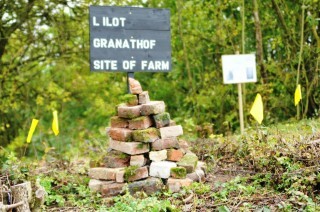 Today, save for many bricks in and around the craters, no trace of the farm survives above ground. 2012 will hopefully produce the geophysics results which may indicate whether vestiges of the farm still exist. If so, there will be one or more sondages to investigate this most symbolic of sites for the Breton troops who held the sector until handing over to the Black Watch in August 1915. Although the site was open to all during the excavation phase, special open days were held on 8th and 9th October. As well as dedicated tours on the surface, the excellent state of the W Incline allowed the Group to take small groups of five visitors at a time safely underground as far as the W Shaft chamber. Visitors queue to enter W Incline in small groups. They were taken to W Shaft Chamber – at a depth of 10 metres underground. 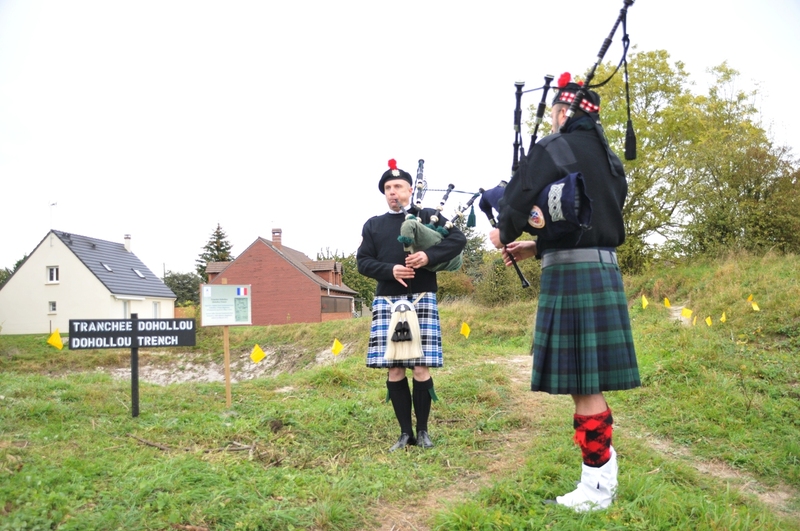 The support and knowledge of local communities is vital to the project, so the portes ouverteson Saturday 8th was dedicated to the people of La Boisselle and the wider Albert region. 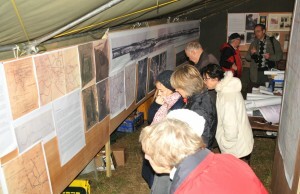 In a large military tent an exhibition was created with maps, plans, panoramas, photographs and artefacts. Fortuitously, a large group of visitors from Brittany were in the area for the rededication of the refurbished memorial at Ovillers to the French (Breton) 19th Infantry Regiment, who held the trenches at the site until July 1915. Family members were for the first time able to visit the site where their antecedents had served. 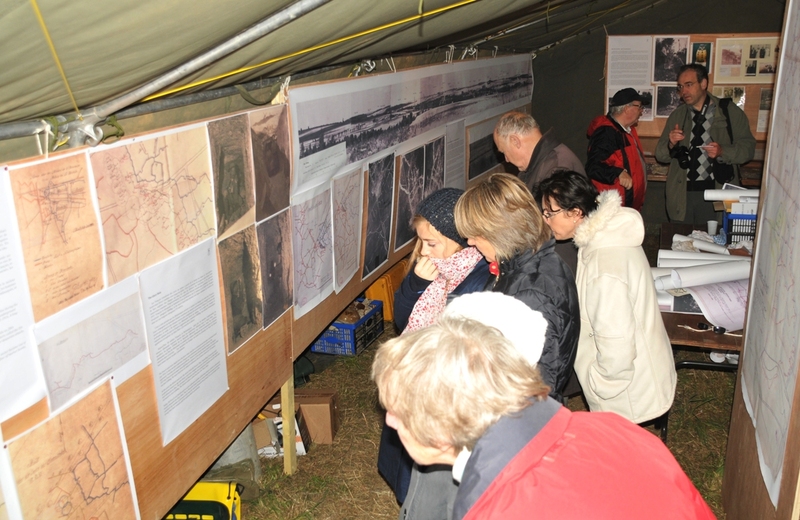 Visitors enjoying the exhibition of maps, plans, panoramas, photographs and art. Other visitors included distinguished French archaeologists including Alain Jacques and Yves Désfossés, representatives of the Commonwealth War Graves Commission, personnel from the DRAC and the Conseil Générale, and M. Jean-Marc Bassaget, Sous-Préfet of Péronne. The Group was especially pleased to welcome the descendants of two British tunnellers who served at La Boisselle, one of whom died underground and is buried at nearby Bécourt. In the evening at a special vin d’honneur the Group took the opportunity to thank the many organisations and individuals that have assisted and facilitated work on the project so far. These included the Lejeune family (the proprietors of the land), Mme. 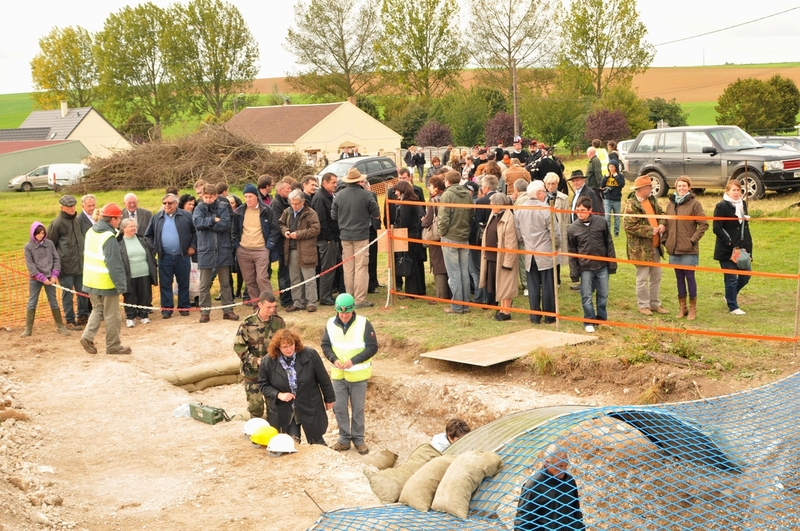 Line Wattraint, Maire of Ovillers-La Boisselle and her Adjoints (and family), M. Stéphane Brunel (Conseiller Général of Albert county), the Conseil Générale of the Somme, the DRAC and CIRAS, the Historial de la Grande Guerre, Péronne, the Securité Civile and the Service Déminage, the Delporte and Villain families, and the numerous local people who had made the first stage of the project so rewarding and pleasurable. Toasts were drunk with French champagne, English Chapel Down sparkling wine, and with William Hackett Ale, a beer specially brewed for the occasion by Barngates Brewery in the English Lake District. William Hackett of Mexborough, Yorkshire, is the only tunneller in history to be awarded the Victoria Cross. Sunday 9thwas a day for the general public and the Group were delighted to welcome many visitors from the UK, Germany, the Netherlands, Belgium, Canada, USA, Australia and New Zealand. Jeremy Banning is helped out of W Incline by historian Simon Jones – the first person to emerge from the tunnel for over 90 years. Poem in X Incline. It was most likely written by an infantryman on fatigue duties. Daniel Deschamps from GIEOS at the site of the poem in X Incline. 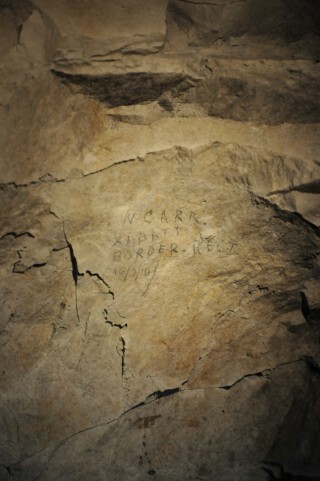 The name of William Carr, dated 16 March 1916 on the wall in W Shaft Chamber. William Carr was serving in the 11th (Lonsdale) Battalion, Border Regiment in March 1916. He was killed in June 1917 whilst serving with the 2nd Battalion and is buried in Grevillers British Cemetery near Bapaume. More graffiti in X Incline from 11th Border Regiment men. Two of the names are those of Obadiah Henderson and William Chard. View from W Shaft chamber. The tunnel from X Incline joins from the left whilst W Adit, driven in March 1916, is running to right. W Adit entrance after its opening. Iain McHenry and Gerard Delaney clearing debris at the entrance to W Adit. 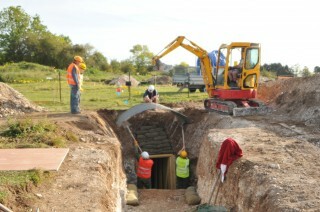 The entrance to W Adit, already timbered & sandbagged receives the first of its elephant shelters. 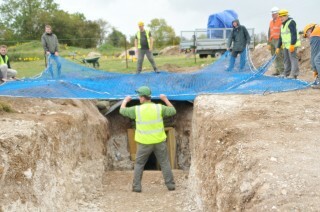 With site safety of prime importance, netting is placed over the W Adit opening. French archaeologist Romain Leroy exposing the sleeper and rail pattern of the tramway in W Adit. 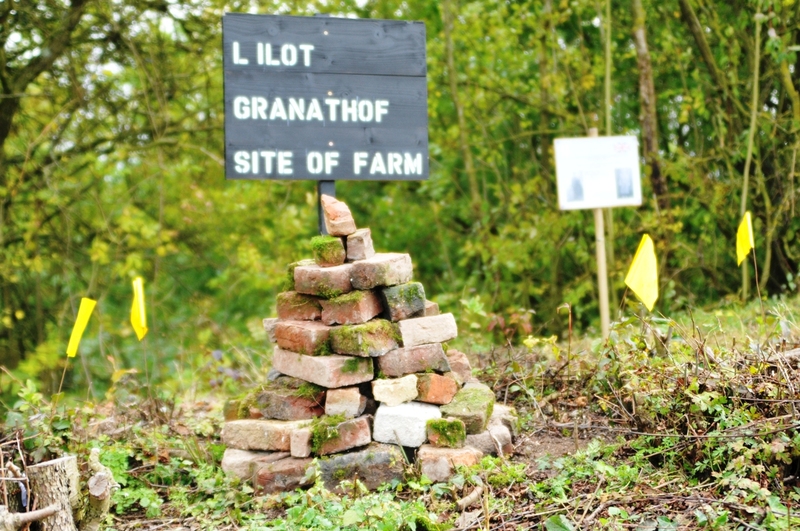 Sign boards and a temporary memorial cairn mark the site of the Granathof. It is built with bricks from the original farm found in the craters. 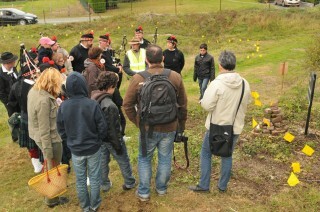 Archaeologist Anthony Byledbal with visiting Bretons at the site of the Granathof. Sign marking the spot where Sappers John Lane & Ezekiel Parkes still lie entombed at a depth of 24 metres following a mine explosion on 22 November 1915. Visitors pay their respects at the spot where eight French miners, killed on 7 February 1915, still lie entombed. Romain Leroy shows visitors the work completed on the entrance to X Incline. Bretons piping at Tranchée Dohollou, named after Second Lieutenant Jean Dohollou, 19th Infantry Regiment, killed 3rd March 1915. Sandbagged steps facilitate access to W Adit. 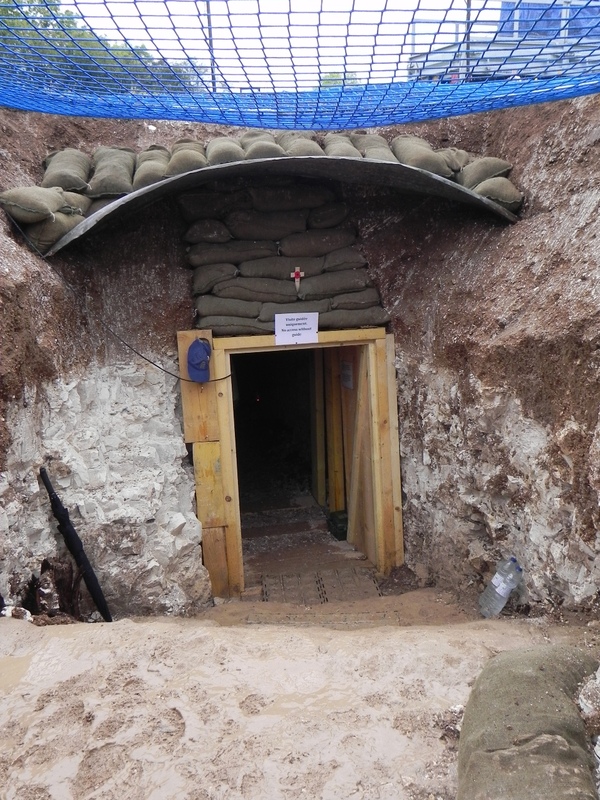 The entrance to W Adit – made safe with timber, sandbags, elephant shelter and safety net. 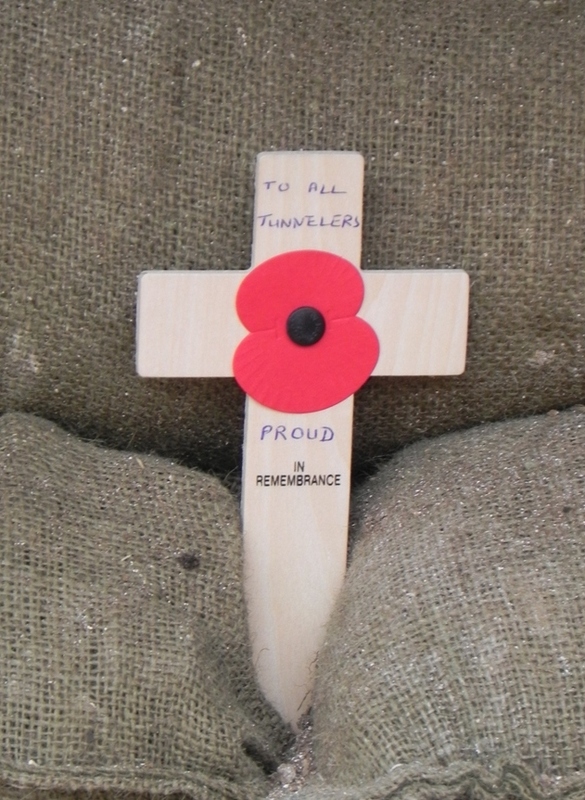 Memorial cross above the entrance to W Adit placed by Barry Maule, nephew of Sapper George Maule, 179 Tunnelling Company RE. Along with 3 other friends and by pure luck, after one of my friends had spoken to a workmate from Northern Ireland on another tour of the Somme, we visited the site at la Boiselle in May 2013. Although the site was officially closed for tours, and because there were only four of us, Colin gave us a full hour to tell us the stories of the site and show us the tunnel systems. 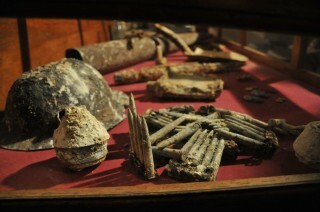 Not having a clue about the underground warfare, I found the whole experience facinating, humbling and moving. I came to the Somme to visit the Thiepval Wood area where my Great Grandfather, Henry Hunter, (Limavady, County Londonderry), 10th Royal Inniskilling Fusiliers, fell wounded on 1st July 1916 which was moving for me, and the visit to la Boiselle was on a par with that. Thanks Colin. Looking forward to visit the site. I have been spelunking along the l Argue at Meicourt Swiss border, German bunkers at the farthest southern end of the trench line. Mostly all still there hidden away in the forest. For 11 years our school has visited Lochnagar crater and it was only last week that we happened upon your archaeological dig whilst visiting with 92 of our year 10 students who are studying the First World War. Many, many thanks go to Jeremy Banning for taking the time and the trouble to show the students around the site in two large parties and to explain the significance of the war underground in 1916. Ironic that there were men from different nations fighting and dying there nearly 100 years ago and now women and men from different nations are co-operating with their diverse talents to literally uncover more truths about the first world war. We will be making a donation to further the tremendous work being done already. Thanks for preserving a very important part of the Battle of the Somme. Keep up the good work. Although I am from the US. I have studied the war extensively. War is always horrific but World War I was the most horrific war of the 20th Century. We visited on our Somme/Ypres Trip on 1st July, 2012. It was a proud moment for me as my Great Grandfather PTE SILLENCE Suffolk Regiment was killed MIA on 1st July 1916 at La Boisselle, which as a family we visited 3 years ago. We had no idea about the tunnel until after the ceremony at the Great Glory Hole early on the 1st July, after the ceremony we visited the brave men at the dig, all volunteers may I add, we are proud of you all men, thanks, we were showed round apologise forgot the gentleman’s name, (ex R Marines) we were informed that volunteers are required in September, all work voluntary, with no funding from the lottery (not in UK) joke and no funding from Government, joke, monies made from collections at the dig, what a disgrace. To you all keep up the great work, Thank you, on payday I will make a donation promise, and if can get time off I will gladly volunteer to help in September, all the very best to you all Steve Richards ex SGT The Queen’s Regiment. Just a well done to he whole team working on site. Visited on Sunday 6/5/12 with our group from Liverpool /Blackpool would like to thank Jeremy and Peter for the tour around the site this was outstanding. We will be back 1st of July with our group Friends of the Somme Liverpool for another visit.Thanks to Claudie and Derek for allowing us on the land.See you 1st of July in Montauban. Thank you for the tour earlier today (13/05/12), the site is a fantastic slice of history and I envy you greatly for being able to get down there and see, what is essentially a large time capsule; giving us all an insight to part of a wider mining and countermining operation, which often doesn’t get a mention when it comes to people reviewing the First World War. Once again, thank you, you really didn’t have to let us in but I’m glad that you did. I wish you all the best with the project and will definitely be keeping tabs via this website. 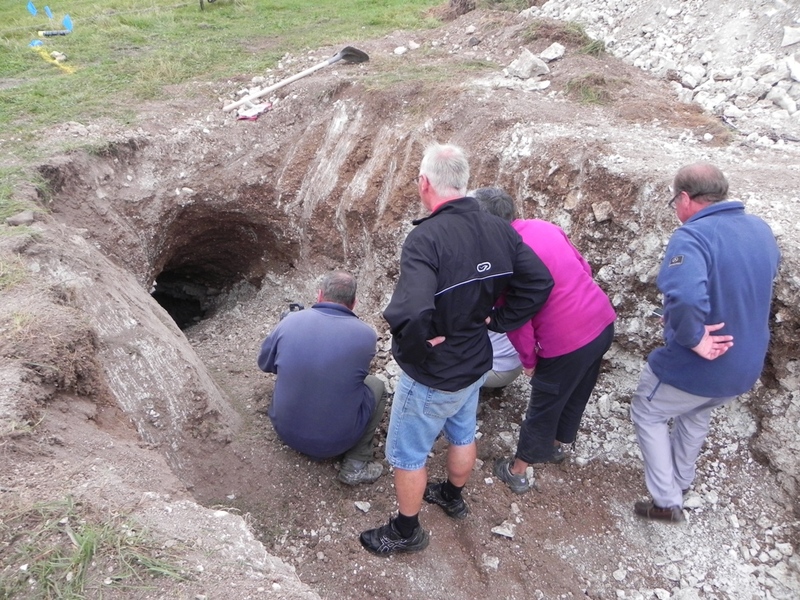 Having asked Jeremy Banning earlier in the year if we could be quickly shown around the dig site whilst we were passing on route to our hotel in Albert we were treated to a excellent 2 hour tour of the whole site including the excavated tunnels. The research and work involved in this project is astounding and when the site is opened for more public viewing this will be a must for anyone visiting the Somme area. Good luck for all the team in this worthwhile project. Good work done. As a dowser investigating secret underground tunnels and managing to enter some over the last two decades, I empathise greatly with your work. It is important that such work is continued and recognised by the authorities. A lot remains to be done about such sites from both WW I and WWII. Carry on the good work. A little about my own research if I might be so bold. I learned how to dowse in July 1993 and was instantly hooked when the two dowsing rods that I was loaned by a dowser moved in my hands. As a former Police Officer, dowsing was a totally new, and unknown, concept to myself and difficult to place any credence in. However, after several years “learning the ropes” as it were, I became quite proficient. 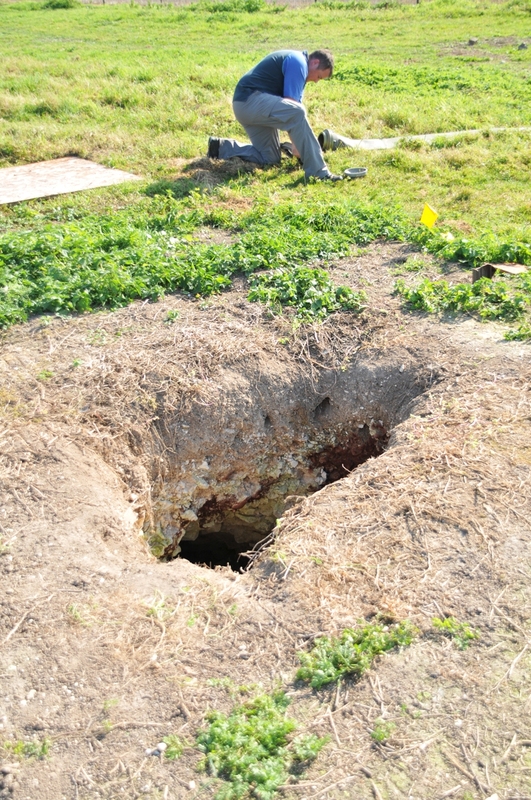 I knew how to “recognize” various things unseen underground, mines, graves, wells, pipes of all kinds and tunnels! I began to concentrate on tunnels for some reason. Possibly because of their rare curiosity value. I researched a great deal and chose my targets carefully. From the beginning, I began finding evidence of them with regularity. In fact, I never failed to find a tunnel! I am now confident enough to guarantee a find where I say it is where I have researched the location. Even down to compass bearings. Eventually, it became apparent that the ancient Roman Catholic Church was responsible for many of them as many of them led from, or to, Churches, monasteries, nunneries and Granges (A “Grange” is a monk’s granary and is where the tithes (Tenths) of the population loyal to the church were stored. 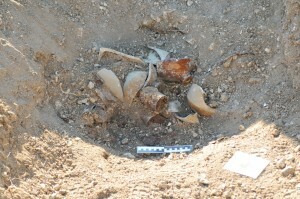 The evidence points to their construction being around the C12th. I have found documentary evidence of some of the tunnels and now have a collection of such material gathered from old books on Newcastle and districts farther afield. I have taken many photographs of properties where these tunnels lead and the majority of the owners later admitted that a “legend” exists of a tunnel exiting their property leading to where I have dowsed it from in the first place. Enough of that. If anyone is interested in my research, please feel free to ask any questions. I am happy to answer any. Hi Jeff, I work as a volunteer guide for the Victoria tunnel and I’m particularly interested in your work dowsing secret tunnels. I’ve recently found (and seen) what I believe to be the tunnel from st Bartholomew’s nunnery in Newcastle. I have photos which I can share with you and would be able to get access again. I’ve been trying to find out more about it and came across your posts regarding the possibility of a tunnel being there. I do believe you are right in your theories about it leading to religious buildings in Newcastle and I believe it goes much further than I was able to access this time. I would really appreciate you contacting me at kerrylisterpattinson@gmail.com so we could discuss this further, would be very interested to hear your theories and share with you my photographs. Hi, totally fascinated, been going to Somme area annually since 1982 & remember Harry Fellows reciting his poems at Lochnagar one July the 1st. I have got to see this, I’ll even bring my bugle. My Dad Christopher Grieves 1509 24th Batt Nothumberlad Fusiliers (Tyneside Irish) was wounded at La Boiselle 1 Jul 1916. His Father William John Grieves 102472 170th Tunnelling Company Royal Engineers served in Belgium I believe. Both survived the war but its effect on their lives and their families was devastating. The sacrifices made by these men and their colleagues should not be forgotten. Thank you Archaeological Team for all your efforts and also the French landowners for allowing the dig. Can you please say when the next open day will be this year. Thanks. I will be in the area from 1-3 April 2012 – will there be anything open for public viewing at this time? When will there be more open days? Well done to all involved in this important project. I am the grand daughter of William Arthur Lloyd. We never knew where in France he died, only that he was tunnelling at the time. 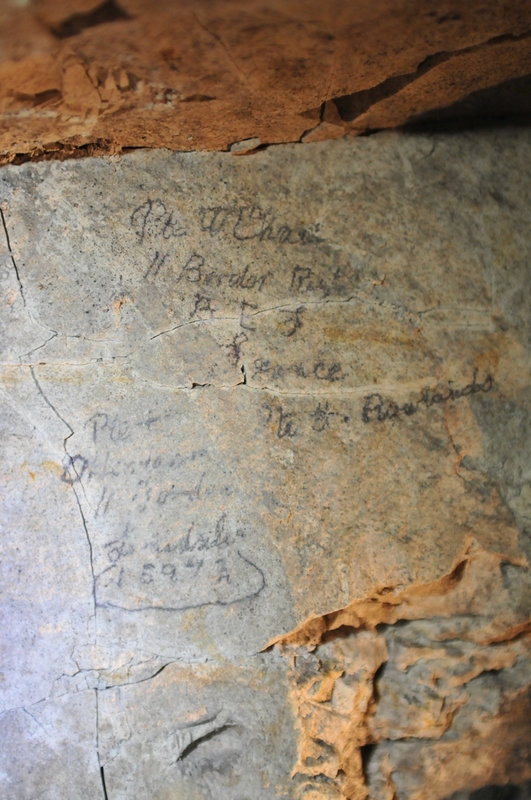 Due to the research of Simon Jones, we not only know the place in France (La Boiselle) but the exact location of his body. Unbelievable!! I only wish this had happened sooner, while my mother was alive. The sad thing is, he left a wife and six children. I would like to thank the Archaeological Team for all their efforts and also the French landowners for allowing the dig to take place. Fantastic work Gentlemen, I would love to be involved in this project. I, like many others , try to visit the Battlefields where my Grandfather fought and Great Uncle was killed every year. I thank the French for saving our heritage in their soil. I insist on teaching my Children the family history in order that the lost will never be forgotten. How brave they were this should be shown to the youth of today, these men are one of the reasons why we are all here today and never let that be forgot wear your poppy with pride I wear mine all year. Is it possible to get more details of two of the men mentioned namely Peter Lane and John Lane i.e. their ages and where they lived before joining the forces ? Hiya. If you mean the John Lane described in the “Tunnellers” section, he was my Gt Grandfather. He was from Tipton, in south staffs, (now west midlands). He was a 47 year old coal miner. I’ve visited the Somme battlefields a few times over the past couple of years, my grandfather fought with the 36th Ulster Division, RIR. In fact I was there with my son at the end of August. Will sections of these tunnels be open to the public? Question:is it possible to admire your fantastic work during November 2011 ? Kind regards, a belgian great war adict. Many thanks for this wonderful work. I am writing a book of historical fiction, set during 1914-1922. Have been studying WWOne for many years and still feel like a beginning student! Currently working on bringing in the Somme to a chapter where some very hard realities about a family in the story are coming clear. The War had such a huge impact on the people of that time here in America as well as all around the world. My Aunt, the inspiration for this book, had 5 brothers go to some aspect of the War. Details of those realities swarmed around us, all the time, before I was born and all during my growing years. I was not surprised to recognize, many years later, my complete rejection of war and all its trappings. Only within the last few years have I come to understand that -even in the silence- I was taught to reject war and all its folly. Yet, what could the world have done in the face of Germany’s hegemony? Many mistakes were made during the war, and after. We are still caught in the web of WWOne and have much to learn, to change, before we can extricate ourselves from The Somme, from any aspect of it. Your work is timely, to say the least. Too many people keep distracted, so they do not have to face our primary responsibility: to reject violence and revenge in all its terrible manifestations. Be well, and I look forward to learning more from your grand efforts. Great stuff! I am bringing a group of some 44 people to Locknagar Crater on 13 November 2011 would it be possible to stop off and take a look. at your site. I have been past where you are working many times but have not be able to stop. If at all possible the time would be 16.45hrs. I am pretty sure that the answer will be no but I would very much like to have a look at what you have done so far. whatever.. I wish you luck. Many thanks for the excellent update Jeremy, it was nice meeting you again, and thanks for the pleasant chin wag. Looking forward to having a closer look at the tunnels next time I meet you on site mate.